If you want to get your motorcycle license, and you have a valid AZ motorcycle permit and your own motorcycle or scooter, then this is the course for you. This course is also ideal for recent basic course graduates, or riders returning to motorcycling . Recent Basic RiderCourse graduates who want to become more confident on their own motorcycle. 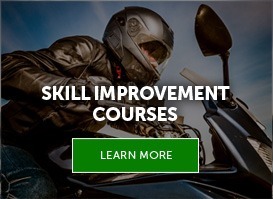 Confident Riders with experience who want to enhance their skills on their motorcycle. Current riders who possess a valid Arizona motorcycle permit and want to waive the state skills test for licensing. Bring a passenger and get more comfortable riding 2-UP. Riders, in general, who want to solidify the basics. Riders wanting insurance discounts after successful completion of this course. What Will I Experience At This Course? 5.5 Hours of FUN RIDING with professional instruction to master your motorcycle. Low speed maneuvering exercises to get you more comfortable with your bike at low speeds. Hazard avoidance exercises including stopping, swerving, and obstacle handling. Cornering at speeds requiring countersteering. Should be able to competently operate a motorcycle through all basic skills.